Gravel Bar was established in 1985 with a mission, to deliver quality Washington wines at an affordable price that anyone can enjoy. Situated in the heart of the Columbia Valley, Gravel Bar has access to the great Columbia Valley American Viticultural Areas (AVAs). Because of this Gravel Bar has been able to fulfill its mission of providing quality Washington wines at an affordable price. 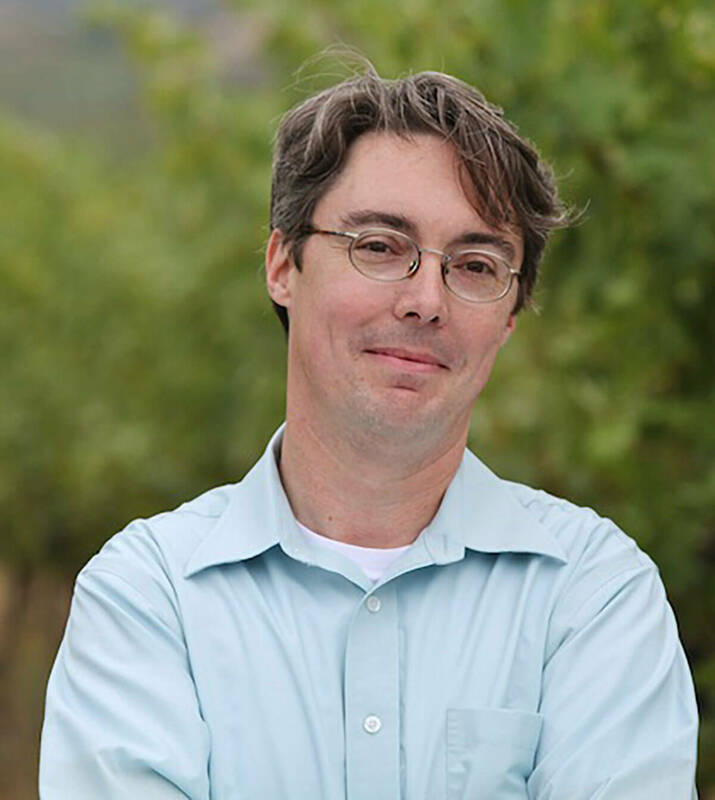 Meet Joshua Maloney, winemaker for Gravel Bar. Joshua studied chemistry at Cornell, and during his final semester he took “Introduction to Wines”. During the lecture on Burgundy the class tasted several wines, including a 1959 Vosne Romanee. That’s when he had an epiphany; that wine moved him emotionally, similar to great music, art, or literature. "I thought that if wine could evoke this kind of response, then I want to be a part of this world and experience that again." Maloney's first role in winemaking was at Heron Hill Winery, in the New York Finger Lakes, as the assistant winemaker. It was there that he learned most of the facets of wine production, from cleaning tanks, filling barrels, to running presses, and even packing bottles on the bottling line. "I was also doing lab work, designing blends, working in the tasting room and working with the sales people in the market place. In other words, I learned a little bit of how to do everything." Joshua now oversees the production at Gravel Bar Winery, while working with Bronco Wine Company to create premium wines with no pretense; Just great wine! The Columbia Valley AVA lies mostly in Washington State, with a small region in Oregon. The Cascade Range forms its western boundary with the Palouse regions bordering the area to the east. To the north, the Okanogan National Forest forms a border with the AVA and Canada. It encompasses the valleys formed by the Columbia River and its tributaries, including the Walla Walla River, the Snake River, and the Yakima River. The Columbia valley stretches between the 46th parallel and the 47th parallel which puts it in line with the well known French wine growing regions of Bordeaux and Burgundy. The northern latitude gives the area two more hours of additional daylight during the summer growing season than wine regions of California receive. The volcanic and sandy loam soil of the valley offers good drainage and is poor in nutrients, ideal in forcing the wine to concentrate its resources into the grape clusters. Nine smaller AVAs designate unique growing areas of special distinction within the larger Columbia Valley AVA. 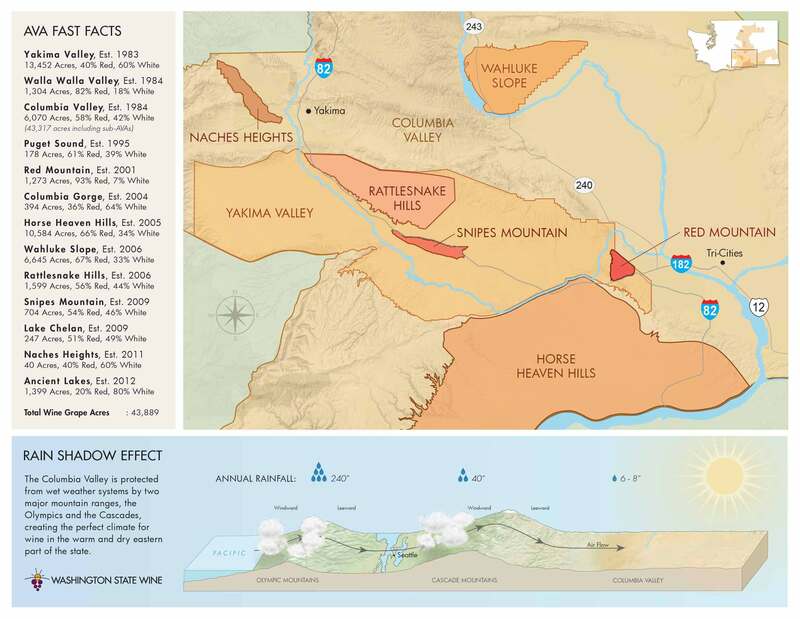 These are the Ancient Lakes AVA, Yakima Valley AVA, the Red Mountain AVA, the Walla Walla Valley AVA, the Horse Heaven Hills AVA, the Rattlesnake Hills AVA, Lake Chelan AVA, Snipes Mountain AVA, and the Wahluke Slope AVA. North of the Rattlesnake Hills is a region commonly known as Columbia Cascade, but which is not officially recognized as an American Viticultural Area. 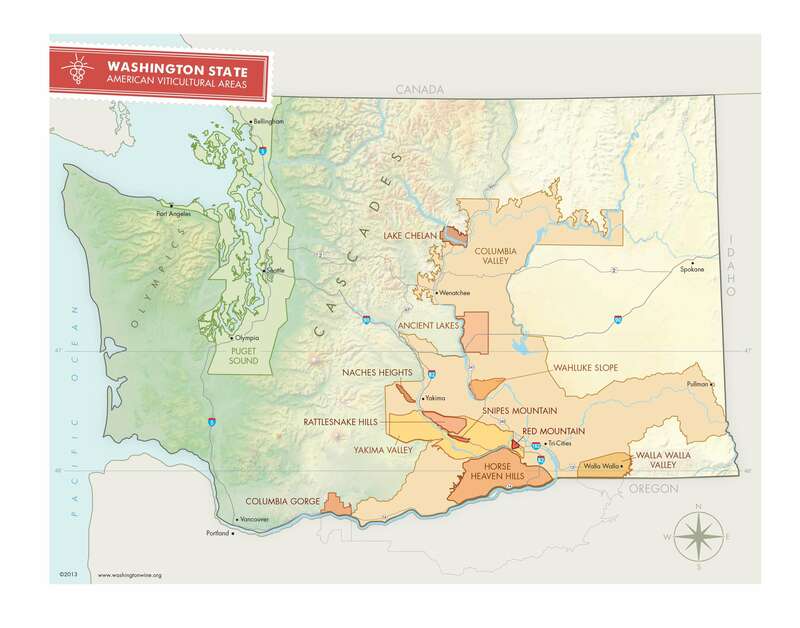 Other wine growing regions of distinction that have not yet been granted AVA status include the Othello region located in Adams County and the Tri-Cities area around the towns of Kennewick, Pasco, and Richland. The vast size of the appellation allows for an array of diverse microclimates among the various sub-appellations, but the whole region shares the common climate traits of cold winters and long dry growing seasons with low humidity. 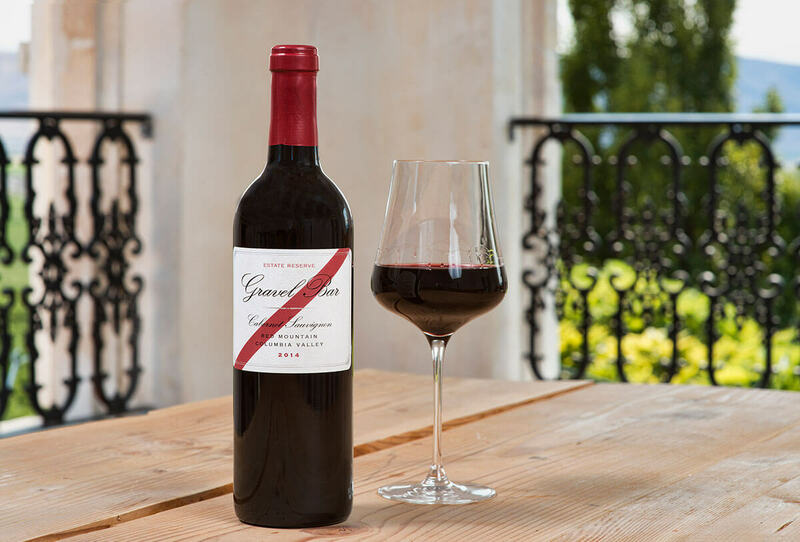 The warm days and cool nights of the area help retain the balance of acid and sugar levels in the grape which give Washington wines their characteristic balance in flavors. The peak ripening of the grapes occurs during the last four to six weeks of the growing season, with the grapes hanging on the vines a little longer than in California. This allows the grape more time to develop maturity in tannins as well as other aroma and profile characteristics that will be brought out in the resulting wines. The longer growing season also allows the grapes to be harvested at a cooler temperature than in other more southerly wine regions. The Red Mountain AVA is an American Viticultural Area that includes the land surrounding Red Mountain in Benton County, Washington. It is part of the Yakima Valley AVA, which in turn is part of the larger Columbia Valley AVA. Located between Benton City and the City of West Richland, the Red Mountain AVA is the smallest in the state at only 4,040 acres (1,630 ha) in area. The area has 600 acres (240 ha) under cultivation of primarily red varietals including Cabernet Sauvignon, Merlot, Sangiovese, Cabernet Franc and Syrah. The reputation of the wines produced in this area has brought Red Mountain AVA worldwide acclaim. The vineyards in this appellation have produced grapes for some of the most sought after wines in Washington State. The Missoula floods, which were a series of massive floods that occurred at the end of the last ice age, greatly affected the Columbia Valley AVA area and had profound affects on the soils of Red Mountain. The soil left behind from the flood have sediments that were deposited in an irregular manner, which created a heterogeneous soil with a series of gravel lenses. Also, in the years since, a thin mantle of dunes were created by the deposited wine-blown loess. The climate of this particular AVA differs from the rest, because of the documented warmer temperatures and higher sunlight hours. Part of this is the unusual terroir of Red Mountain which has southwest facing slopes, which differs greatly from any other part of the Columbia Valley AVA. At night, the temperatures drop considerably which helps preserve the acid levels of the grapes. The cool air from the north, seeking the lower elevation of the river valley, moves downward across thie hillsides planted with vineyards to help keep the grapes from being overheated and also prevents air movement from settling in the area, medigating any frost damage to the grapes.